An oval dining table features curved edges which makes it an ideal table for small spaces and it doesn’t have sharp corners so people in standard size rooms can move around without bumping into it. In oval dining tables, pedestals are popular as people can sit comfortably without getting their legs banging table legs. Another benefit of these tables is; you can always add extra chairs because of the curve of the table design. This article is about top 10 oval dining tables in 2018 including pros and cons of these. In oval dining tables the glass and wood are popular materials because of the wood’s durability and fantastic look of glass. With many great benefits; there are pros and cons, which are discussed in this article. Oval glass dining tables look fantastic and more importantly you do not need the cloth covers for these. The curved edges are easy to clean because of its design. Most glass tables are transparent and you can see through their base to keep these clean. Oval, wooden dining tables not only have the classic look, many of these have an extra feature to be extended, so when you have extra guests you can extend the table to bigger than its usual size. The detachable leaf is another feature which can be used to extend the table or the drop down leaf suitable for small spaces. If you are looking for the ideal furniture that suits your requirements best and makes your room stylish without occupying any extra space, your search ends here! The Leonora Extendable Dining Table is the perfect choice for you! One of the best from Leonora Extendable Dining Table collection. Asian Hardwood with elegant distressing style. Available in the beautiful White/Natural. With its leaf it offers capacity of 6 seats and 4 chairs without leaf. The surface is easy to clean. Use a wet cloth for better results. 1 ✓ Easy to assemble and extend. ✘ Some people think it is too small table. 2 ✓ Can easily fit in room or even in corner of your kitchen. ✘ Some people have said the table can not carry much weight, so it is advised not to put heavy items on it. 3 ✓ Some people think it is good for price whereas there are similar tables bit expensive. Desoto Dining Table set is the true example of comfort, class and elegance which definitely adds value to your beautiful home giving it a stylish yet sophisticated look. Asian Hardwood, distressed with worm holing. Burnished Sienna finish which gives America Desoto Dining Table an attractive and rich medium to dark brown color with undertones of red. Table top is oval shaped with leaf (round without leaf). Can fit up to 6 chairs easily. Comfortable and sturdy chairs are of light brown color. Beautifully designed seat cushions with 100% polyester. 1 ✓ Some people have liked its color and durability. ✘ The table is great while some customers are disappointed by quality of chairs. 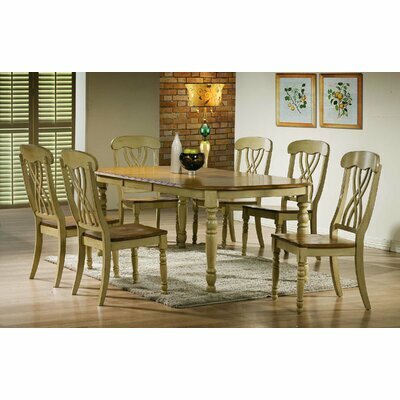 2 ✓ The dining table's size is good for small dining rooms. ✘ Some people have complained it is too small and can't accommodate 6 people as mentioned in its details. 3 ✓ Many people are satisfied by its quality. 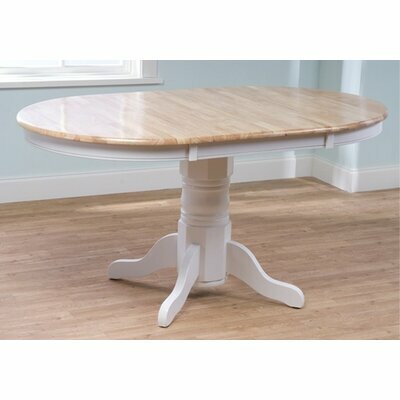 Give your dining room an exquisite traditional and country-style look with this amazing Buena Extendable Dining Table! One of the best from Buena Extendable Dining Table collection. Made from Poplar wood, Asian Hardwood. Table top is oval shaped. Two leaves to extend table top size to 76”. Wide variety to choose from different colors, finish, size and chair styles. Also available in Buttermilk and Cinnamon finish. 1 ✓ Many people have loved the table's cream color legs. ✘ Some people have complained about its quality. 2 ✓ It is heavy and durable dining table. ✘ Some customers didn't like the way the table is distressed. 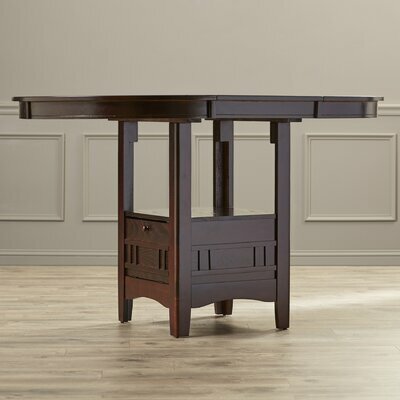 You cannot overlook this absolutely stunning Norwalk Counter Height Extendable Dining Table which gives your beautiful home a modern and trendy feel. 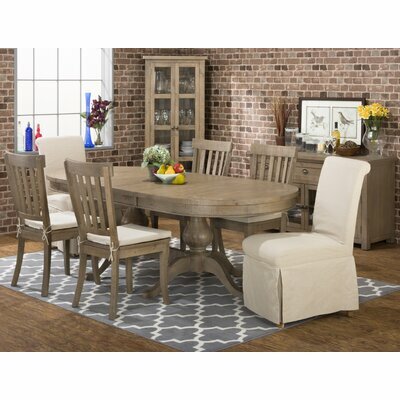 Pair this table with comfortable and sturdy counter chairs (sold separately) from the collection to make a complete perfect matching set. 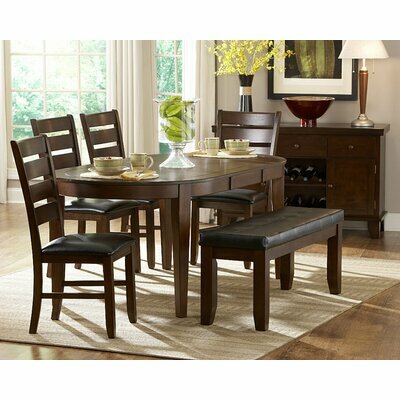 Best from contemporary and trendy Norwalk Extendable Dining Table collection. Single pedestal leg with storage base and sunburst veneer top. 1 ✓ The stickers on table pieces make it easy to assemble. ✘ If you have wooden floor in your room; it would be better to find leg grips for the table as some people have experienced it slips on wood floors otherwise. 2 ✓ Many people have loved its colors. ✘ Even though it is easy to assemble; some people have experienced it hard to do so it would be better to find a family member or a friend to help assembling it. 3 ✓ There are so many people satisfied by how beautiful the table is. Amazingly gorgeous and classy Throckmorton Dining Table will enhance your home décor with its perfect elegant yet casual look! From Throckmorton Dining Table collection. Oval shaped casual style table. Medium oak finish with sunburst veneer. Large pedestal with ball and claw. Easily fits up to 6 chairs. 1 ✓ Some people have found the chairs comfortable. ✘ Some customers think the table doesn't close easily. 2 ✓ People are satisfied by its easy assembly. This appealing contemporary design of Bannister Dining Table comes with an exciting flair of Arts & Crafts in smooth medium brown, dark oak finish. The slick design with butterfly leaf creates an inviting warmth and pleasurable atmosphere to your dining experience. From stylish and sturdy Bannister Dining Table collection. Contemporary design with Arts and Crafts flair. Dark oak finish with birch veneer. Oval shaped table top with butterfly leaf. Easy to clean rich dark brown bi-cast vinyl chair seats and multipurpose kitchen bench seat (available separately). 1 ✓ This table is loved by customers. ✘ No cons have been found yet. 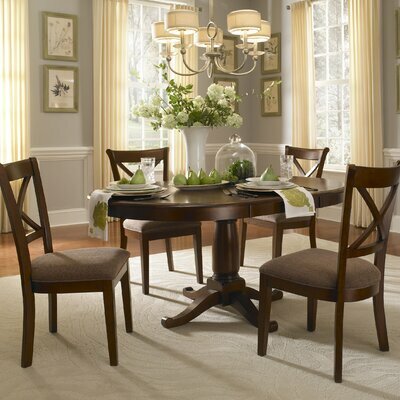 Add value and elegance to your dining experience with this Derby Brown or Almond Green finish Corell Park Dining Table. The Corell Park Dining Table features self-storing butterfly leaf which is handy and ideal for social gatherings. Elegant Corell Park Dining Table collection. Available in two color finish: Derby Brown and Almond/Green. Turned leg style dining table. 1 ✓ Some people liked its quality and colors. ✘ No cons have been found yet. Now you can create an appealing and marvelous focal point in your dining room with this exclusively designed Mercer41 Latinne Dining Table. 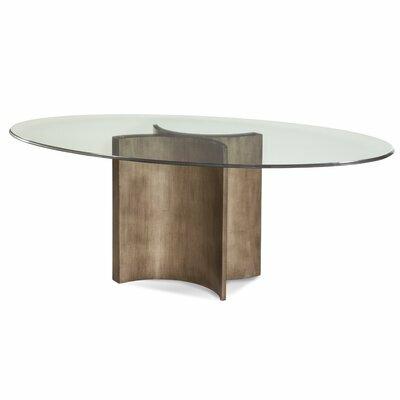 The sculptured table base is meticulous antiqued finish with oval shaped glass table top. It offers you amazing 6 seating capacity. Table base is made from Medium-density fiberboard. 1 ✓ The table can be good even on the wooden floors. ✘ Some people think it is too heavy and they do not like the finish. 2 ✓ Some people are satisfied by the table's base which give modern style even for small rooms. Bring home the comforting country-style dining experience with this elegantly crafted classic Cannes Extendable Dining Table Collection. This versatile handcrafted beauty will add value to your home and it is equally suitable and fits conveniently for both your kitchen and dining room requirements. Now welcome home your guests and enjoy your coffee with intriguing conversations, everyday meal or special occasions and make memories to be cherished around this classic and timeless piece of art. Cannes Extendable Dining Table collection. Constructed from Asian Ramon hardwood. Large single pedestal with adjustable levelers. The butterfly leaf extends table surface to 66”. 1 ✓ Many customers are satisfied and liked the beauty and quality of this table. ✘ Some people have still complained about the quality and they think the wood quality is not so good. 2 ✓ It is heavy yet durable dining table and six people can easily be accommodated. 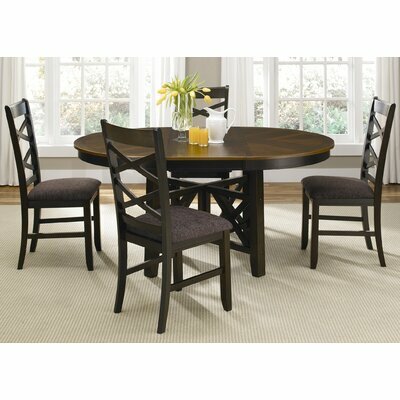 The gorgeous black base finish and a cherry top Mendota Dining Table will make your dining experience worth enjoyable and memorable. 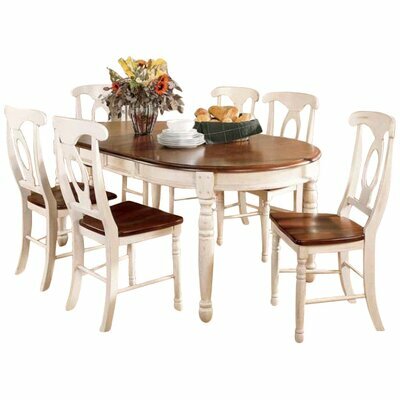 This oval shaped dining table features French inspired carved legs and two leaves that add more space to the table which is perfect for your social gatherings. From stunning Mendota Dining Table collection. Constructed from Solid wood: Walnut and rubber wood solids. Smooth black finish with stunning Espresso. Leaf to extend table top surface to 66”. For better results, use dusting cloth that attracts dust particles. Chairs and optional dining accessories also available separately. 1 ✓ The table's leaf is easy to open and people also have loved the design. ✘ Some people think the table's latches are not good. Large and small flat washers Long and short bolts There could be spanners and Allen keys too. Place all parts on the clean surface, you can also use a carpet to prevent the parts from being scratched. Check the instructions provided by the manufacturer to follow the steps. Because of having this shape; these can also be placed in narrow kitchens and you can also add small stools to save some space in the room. These stools can be placed under the table.